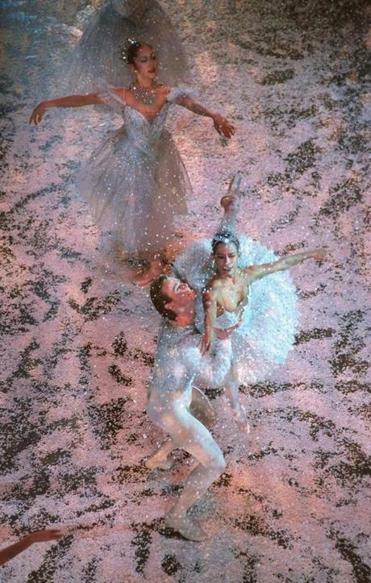 Snow falls on dancers in a 1996 Boston Ballet performance. To an audience, “The Nutcracker” can be pure magic. Not so for many professional dancers. Just wait for the groans, eye-rolling, and complaints of soul-sucking monotony from members of the corps de ballet who routinely dance several parts each evening in up to 50 shows a season. I know; I was one of them. First as a young child, and later as a member of the New York City Ballet, I danced in “The Nutcracker” for 17 years. I witnessed plenty of drama backstage, and many impromptu and comic moments on stage. With such a large production and so many moving parts, things are bound to go awry, and they did. For many dancers, “The Nutcracker” is the first ballet we saw as children, the inspiration for us to begin taking lessons. I was 4 when my mother took me to see Boston Ballet perform at the Wang Center, and I remember being completely transfixed. To me, the tree was really growing, the Mouse King was actually a giant, terrifying beast with multiple heads, and the snow was really falling inside the theater. It blew my mind. And like many dancers, my first performance on stage was in “The Nutcracker.” The auditions at Boston Ballet’s Clarendon Street studios were an absolute mad scene. Mothers sprayed their daughters’ hair until it had the texture of linoleum; in the hallways girls stretched and practiced the choreography they would dance for the judges. There were no guarantees that everyone would get a part, so tensions were high. Kids would return from their auditions either skipping toward their awaiting parents or collapsing in tears. The first time I ever performed onstage, at age 8, I was a “B cast” lamb in the “Marzipan” dance. I remember rehearsing in my living room for my parents, positioning my hands in front of my sternum like hooves: Hop hop hop. Skip skip skip. Hop hop hop. Upcoming dance performances to see in the Boston area. “The Nutcracker” was also a special time because we performed alongside real dancers of the Boston Ballet company. I remember the commotion backstage when, during a performance, the Cavalier, Roger Cunningham, went outside at intermission to feed the meter (or perhaps smoke). When he returned to the stage door, it was locked. He tried banging on the door, but no one could hear him. He had to enter for the second act through the crowded lobby in his ruffled costume. That was one of my first hints that sometimes performances don’t always go as planned. My favorite moments were when we children were allowed to watch from the wings. We were supposed to be returned to our dressing room in the theater basement as soon as we exited the stage, but every now and then a chaperone would allow a few of us to linger. My favorite was the “Waltz of the Snowflakes”; paper snowflakes fall on the stage as dancers twirl and leap. Little did I know that less than a decade later, I would perform this dance to the very same Tchaikovsky score as a member of the New York City Ballet. My 10 years of training had led me there, and I was elated to finally be performing with the company, but the “Snow” dance didn’t quite have the same glamour that I remembered as a kid: I quickly discovered that the paper snow is treated with fire retardant that makes it taste like permanent marker. Stagehands wearing protective gear swept the stage and dumped the snow into barrels to be recycled for the next performance. By the end of the run, lost earrings and even pompoms pelted down on us. And whenever a dancer ran offstage into the wing, the first thing she did was spit the snow out of her mouth. In contrast to the dreamy dance the audience observed from the front of the house, the mishaps that occurred during “Snow” were infinite. The paper was slippery under our pointe shoes, so girls were constantly falling; sometimes there would be four girls down in a single performance, but they’d just hop right up and keep on going. One time, the Bunny from the battle scene, danced by a school child, wet herself onstage, and we had to navigate around the yellow snow. The dressers were furious afterward because one of the dancers had to kneel in the puddle, and her costume had to be cleaned for the next performance. 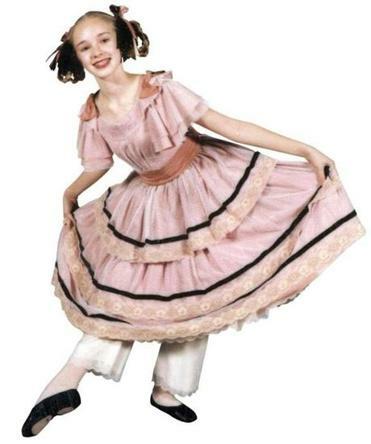 As an apprentice with the company — the trial year before earning a corps contract — I performed in every cast of “Snow,” alternated the “Spanish” dance with the “Waltz of the Flowers,” and was an “A cast” maid in the party scene, which primarily involved taking coats and serving the party guests. The irony of training for a solid decade in order to pantomime menial labor was not lost on me. In my first season with the City Ballet, about two weeks into the nearly 50-show run, I began to feel run down. Because we were around one another constantly — if not on stage or in rehearsal than in the dressing room — everyone was ill. And once the cast was dwindling, calling in sick was not an option. One corps dancer had a stomach bug and would throw up in the wings whenever she ran off stage. The more senior corps dancers sometimes began the “Nutcracker” season with performances off, but that generally didn’t last for more than a show or two before they had to fill in for someone for the entirety of the run. While the rest of the world could look forward to time off around the holidays, it was the opposite for us. On the weekends we performed four times, and we only had a day and a half off for Christmas. There was so little time in between weekend performances that we’d run across the street to the deli in full stage makeup and hair. We’d just throw on sunglasses. Toward the end of the run each year, we’d be shells of our former selves: We were emaciated and cranky. Just hearing the Tchaikovsky score in the mall would trigger fits. Once a dancer who was to be a Soldier in the party scene left after company class, not realizing he was expected to perform that afternoon. As the scene approached, the dressers were alarmed when they noticed the Soldier’s costume still draped on its hanger. But it was too late to find a replacement or alert Drosselmeyer, who was supposed to present each doll. When Drosselmeyer — played by Robbie La Fosse — found the toybox empty, he improvised a solo to fill the minute and a half of music. I danced nearly every single performance of “The Nutcracker” for nine years with the New York City Ballet. Despite all of the mishaps, the goofiness, and the tedium of dancing the same roles again and again, there were still moments when I would look out at the stage from the wings and get swept up in the magic. I was endlessly impressed with the durability and professionalism of my fellow dancers, and I felt so lucky to be a part of it. After each season’s run was finally over and we returned to a more varied repertory, I sometimes missed hearing the reactions of the children in the audience; they’d exclaim “Wow!” as the tree grew or sometimes shriek with excitement. Normally when I performed, I would be so involved in what I was doing that I would forget that anyone was watching me at all. But in those moments, we were reminded of whom we were dancing for, and why we were drawn to dance in the first place. Sophie Flack is the author of the young adult novel “Bunheads.” She can be reached at sophie.bunheads@ gmail.com.